When staying in a SunHost unit you will also have access to 7 day a week office staff, office services (fax, copy, print boarding passes etc.) We also have maintenance available 7 days a week if you experience any issues at the property and an after hours emergency on call person. Weekly maid service is provided. This is a nonsmoking unit. We loved our week long stay at Surf Song 256. The room was clean, decorated cute and the view could not be beat. We were impressed with the grounds and the friendliness of the other renters we met. This unit has all you will need for 2 people and we will definitely return and ask for this unit. The only negatives if I had to come up with any were the bathroom is small..the tv was very difficult to figure out. The first lady I encountered at the office had the personality of a rattlesnake but the other two ladies I spoke with in the office upon check out were fabulous and friendly!! 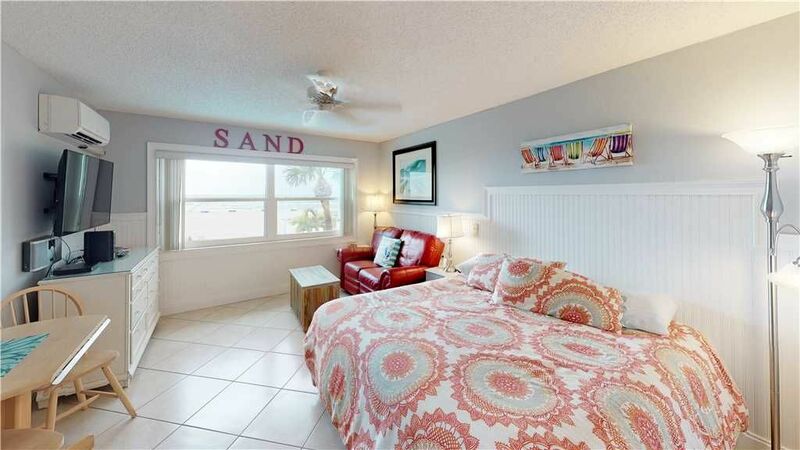 This was a nice condo with a view of the beach. The window is right above the pool so this may bother some people. The place was clean but the room is very small it’s really just a place to sleep and shower. We were fine with that but I wouldn’t plan on having a family stay here. Some cups and other dinning wear are provided but you don’t have a dishwasher so you’ll have to hand wash everything in the bathroom sink. The walls are very thin and the room has a door that appears to lead to a neighboring room so you can hear any conversations going on we were woke up some days at 8 due to noise and some loud night conversations but overall everybody was quiet. The pool was nice and relaxing with a good stretch of beach steps away. With that said the pool closes at dusk so no night swims if that’s your thing. The place was very quiet with mostly older couples sitting around the pool which was nice. It’s right across the street from John pass which in convient as you’ll probably have to buy your meals out unless you grill downstairs. The food at mad beach brewing was the best we found. There’s also a coffee shop within walking distance. You can find very fair priced breakfast on the boardwalk at the boardwalk grill. The location is good we went in late September so not a lot of people around with kids. Overall it was a good experience for what it is. Again it is mostly a place to stay and shower not really a place to live for a few days. Plan on eating out most of the time. The condo was terrific had a great view, however the red tide kept us from going to the beach and The pool, thoroughly satisfied with the condo we stayed in however we had to leave from beachfront at our condo to travel miles and miles to find a beach that didn’t smell to high heaven..just wish we had been notified of theRed tide before making an 1100 mile trip just to NOT be able to enjoy the beaches or the pool!! Had I been given a choice I would have probably postponed my trip and took a small loss and canceled, in hindsight I wish I had of taken a loss in the condo and came at a later date..sisters from Kentucky! Our first few days were very nice and then a few families came with kids about 8-13 years old and they pretty much took over the pool. Pool was suppose to be closed at 9:30 but they were still messing around and pretty noisy at 11:30. The overall property was great and we would return. Well located and in walking distance to many things and good restaurants. My husband and I chose this beach-front studio for our anniversary. Everything was great! We had everything we needed, comfy furnishings, quiet room, friendly and helpful office personnel, magnificent view and located across the street from John's Pass! We highly recommend the Surf Song Resort. Located directly on the beach across from John's Pass Village and Boardwalk with it's many shops and restaurants that you can walk to.